Not sure I'm in the right section but hope a moderator will move my topic if it is better placed somewhere else. Two years ago I bought a RAM suspension. I wanted a reduction of the seat height of the RS. Just about 1-1,5 cm so my heals would touch the ground when taking a full stop. The RAM gives about an inch so everything fine in the sense. I road 1000 km but never got it adjusted right so I took it off. Also I had to shorten my side stand because with the RAM it was too high. The centerstand also became impossible to use, with out putting a board under the back wheel. Needles to say I just got tired of messing around. Today however I thought why have something almost brand new and very expensive just laying around. Sell it or try once more. The shorten side stand back on and the the RAM on. First ride ok, but need to try with passenger, side bags and top box with weight in them before I'll know for sure. Now there are some excellent knowledge people in this group so here is my questions. The small black screw. Think it is called the "damp adjustment". It has about 20 clicks but absolutely know idea what it does. What is the difference of screwing it all in (clock wise or all out)? What is the purpose (please don't write "adjustment of damp ". Also the large adjustment ring that either makes the spring shorter or longer. I'm assuming that when I screw it up and put pressure on the spring I'm making the suspension harder and when I screw it down softer. So up for passenger and bags and down for single ride with no bags? Also whe screwed up I'm assuming the actual suspension gets longer and there by the seat height higher. The small black screw at the bottom is the damper adjustment as you thought - I have mine set about 5 "clicks" from its full anticlockwise setting. 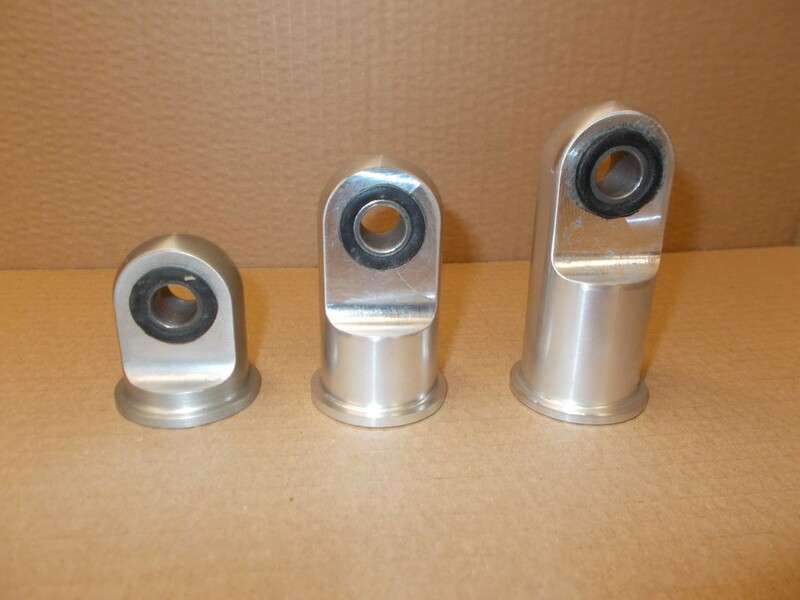 The big adjustment ring is for setting the suspension pre-load. If you have it set too soft and ride with pillion and luggage, you will probably keep bottoming out (very uncomfortable). If you have it set too hard (lots of pre-load), and ride solo and without luggage, you will find the back of the bike is too high for you. The fact that you are struggling to get the bike on the centre stand suggested that the shock is set too low - which means you have to lift back of the bike to get her on her centre stand. I know from separate experiences (failed shock and flat rear tyre) that it doesn't take much lowering of the back end to make it very difficult to both get her up on her centre stand and this also makes her sit very upright on her side stand. The fact that you have had problems with both the side stand and centre stand does point firmly at your shock being too short. It sounds like you have probably set it that way to help get your feet on the ground, but this is actually adding to your problems. Hope this helps - if all else fails give the guys at Realm engineering a call (or email if that is easier language wise) - they are very helpful and do provide excellent after sales service. Thanks Paul I did correspond with RAM many times but I wasn't able to get the needed help. Maybe because I just didn't know the correct technical terms. What you really need to tell me is how do I get the seat height up (and getting the original side stand to work, and the center stand to work), by moving up the large adjustment ring (putting pressure on the spring making I shorter) or do I raise the seat height by loosening the big adjustment ring, and thereby making the spring longer? Just took a ride with my son on the back, threw down the bike in a turn and my center stand hit the ground. So I'm well aware that my bike is too low. I'm just not sure if I should turn the adjustment ring up our down. Somehow I have gotten the impression it should be turned up (putting pressure on the spring). I did 20 "click" but couldn't measure any difference in height. Also please let me know why/what the damp adjustment does. And which way to turn to make it go "this or that" (what event it is it does). The length of the shock that you bought determines the seat height. There are different lengths for different bricks. The spring adjuster is just there to compensate for load (passengers and luggage). The black knob is the rebound damping and makes the back feel harder or softer. 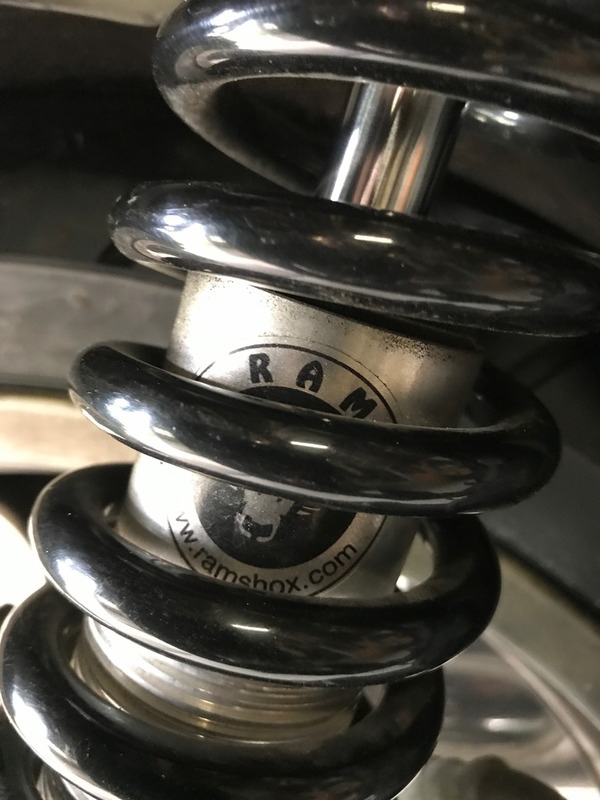 If you have problems with the centre stand then you probably have the wrong model of RAM shock. @BobT wrote: The length of the shock that you bought determines the seat height. There are different lengths for different bricks. Thanks so turning the damp adjustment screw clockwise will make i feel harder or softer??? I sure don't hope (or think) I got the wrong RAM. I specifically ordered it for the K1100RS so I'm assuming the RAM company know what they are doing. It also fits perfectly in the mounts so can't imagine it should be for another bike. How ever I specifically ordered the model that would lower the K1100 with about 2 cm. I still need someone to tell me if the bike gets harder or softer by turning the ring (which way for what). More clicks = shock is not so bouncy on a rough road. Main adjuster ring turned anti-clockwise = when you sit on the bike, the bike does not go down so far at the back end and makes the suspension harder. @Dai wrote: More clicks = shock is not so bouncy on a rough road. Ok I'll see if I understand "more clicks"?? Compared to what. I need to know if I turn it all the clicks I can clockwise is it hard or soft (I want it hard). Meaning not bouncy at all. Main adjuster anti-clockwise is down. Which is reducing pressure on the spring. Correct? If you ordered the model 2cm lower then the whole shock is shorter. That is why the stands are too long. @BobT wrote: If you ordered the model 2cm lower then the whole shock is shorter. That is why the stands are too long. But it is still a K1100RS RAM so I'm asuming I should be able to use it without "wobbling" or main stand hitting the road in rough turns. What I need help with is how to adjust it. Sure I can turn the damp fully clockwise take a ride. Then turn it fully anti clockwise and take a ride and see what feels more hard/soft but I'm hoping there are some forum members that own a RAM and will now. Search the web on how to set the "sag" on a bike. Do that with the spring adjuster, dead simple. Back the black know anti clockwise till it stops, that is max soft, turn it clockwise 3 or 4 clicks, go for a ride. Stop after 2 kms, turn it clockwise 2 more clicks and you will feel how much stiffer it feels when you ride it. Then adjust it to how hard you want it. You seem to be trying to make life very complicated. @BobT wrote: Search the web on how to set the "sag" on a bike. Do that with the spring adjuster, dead simple. Back the black know anti clockwise till it stops, that is max soft, turn it clockwise 3 or 4 clicks, go for a ride. Stop after 2 kms, turn it clockwise 2 more clicks and you will feel how much stiffer it feels when you ride it. Then adjust it to how hard you want it. Damp fully clockwise = hard (not soft). Big ring down = longer spring = higher seat level. Any way thanks you just did help me regarding the damp adjustment. I'll turn the black damp adjustment 100 % clockwise since (from your post) it will give me the hardest suspension, which is what I was asking for. Then I'll ride and if it's too hard I'll turn it anticlockwise. Right now it is 7 clicks clockwise which is WAY too soft. So if I follow your advice (3-4 click) it will be even softer. Am I right? Sorry I'm not trying to be a jerk I'm just seeking a no BS straight answer. So damp fully clockwise and big ring down, right??? "Big ring down = longer spring = higher seat level." No Big ring up or down to set the sag. The height of the seat is the length of the shock and you have one that is 2cm shorter. I am going to bed now, my head hurts. I appreciate your frustration, and I can see you are not getting the explanation you understand, especially about the length of the shock. I had the same issue, and it is one of understanding how the spring, and specifically preload works. Hopefully I can help. The shock, as it is, is as long as it is going to get. Adjusting the collar will not change the length of the shock, or the height of the bike at rest. 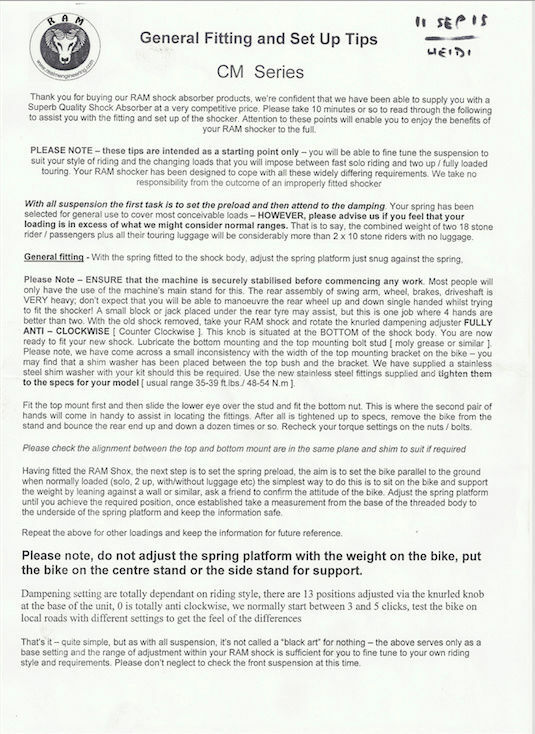 It will change the height of the bike when you are sitting on it - read on. 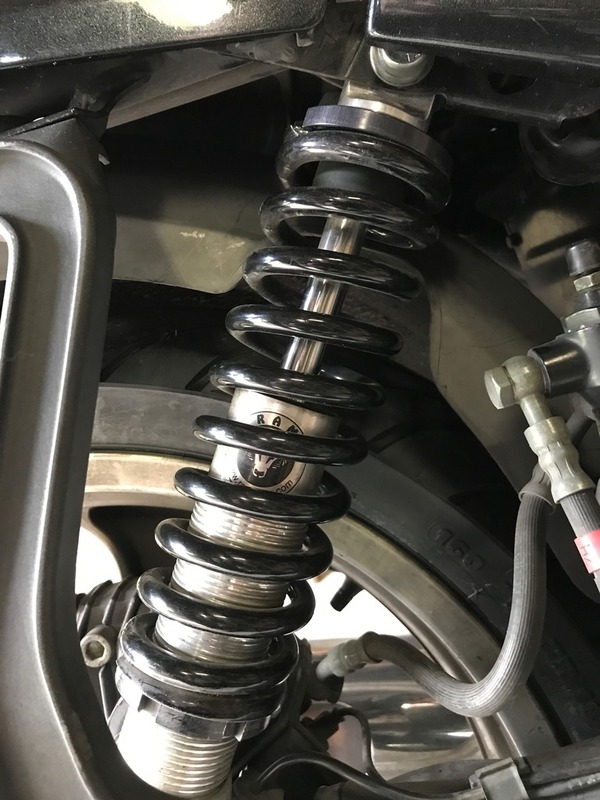 Look at it this way - at the moment the spring is under compression, so why would putting it under more compression change the length of the shock? The spring is trying to open the shock, and the damping rod at the centre is holding the shock at it's correct length. Putting more compression on the spring isn't going to change that. 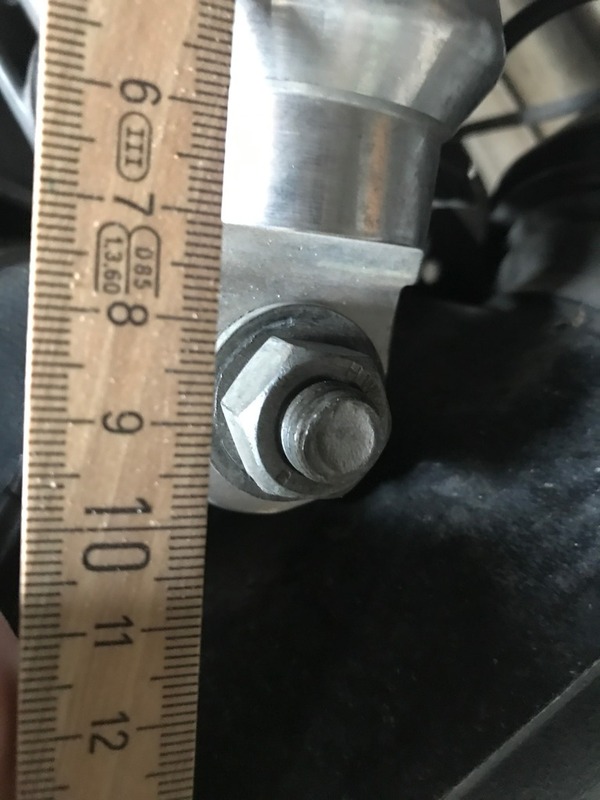 Now, understanding that the shock is never going to get any longer, and therefore isn't going to change the height of the bike, the question is, what does the pre-load collar do? Let's say the shock is on the bike and the bike is on it's center stand. There is no load on the back wheel so the shock is at it's longest (current) length. You take the bike off the center stand and the shock/spring compresses as it now has to support the weight of the bike. You sit on the bike, the shock compresses more as it has to support your weight. Keep going, loading more weight on until the spring is fully compressed, what is called "bottoming out". At this point the spring cannot do its work. it's work is to bounce up and down to suspend the bike. 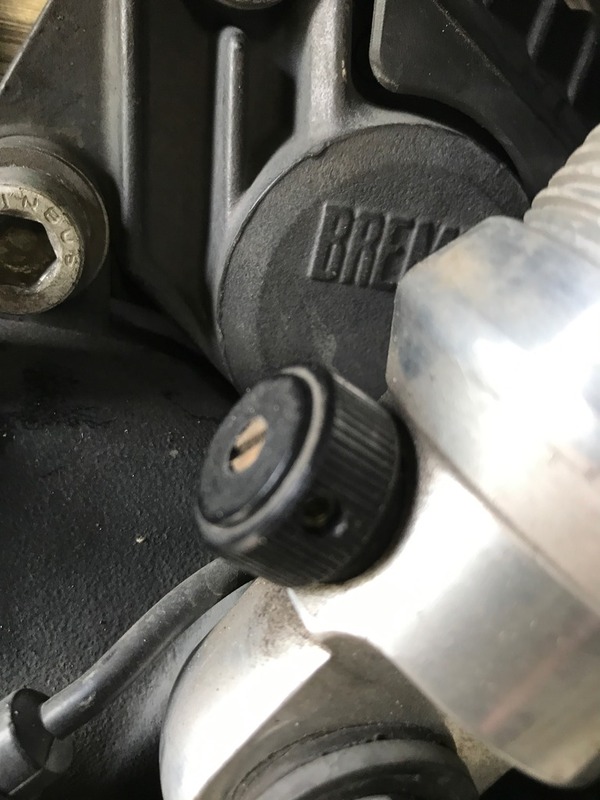 So the job of collar is to pre-load, or pre-compress the spring so that when the load of you and the bike is being suspended, it still has enough travel to bounce up and down, without bottoming out. That is why it is adjustable, to take into account different weights of bike, rider, luggage, and passenger. For example, I have a certain amount of preload when I am riding solo. This is so that when I am sitting on the bike, the spring has compressed by about 1/3 of it's travel. I use more pre-load when I am riding with a pillion. Again, so that when we are on the bike, the suspension compresses by the same 1/3. So your mistake is thinking that the preload changes the length of the shock when at rest. What it does is keep height of the shock when it is compressed by weight. 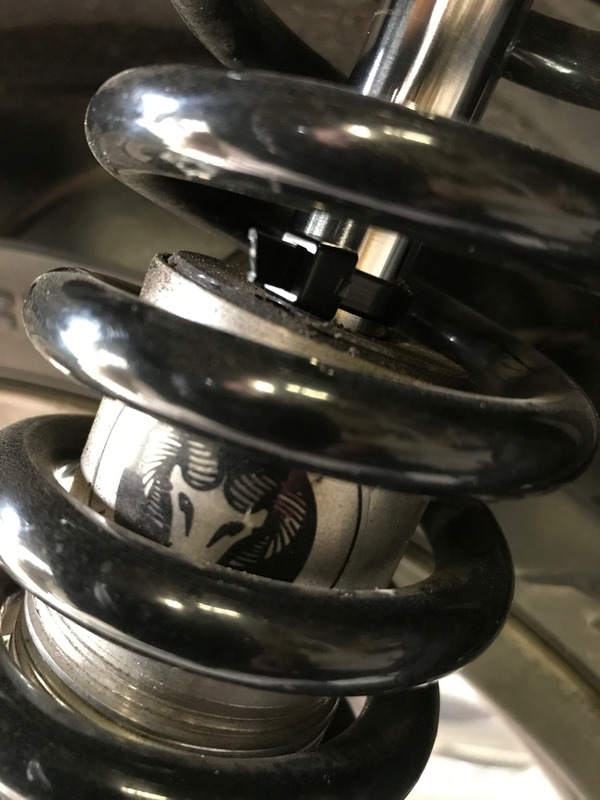 In other words, your shock is never going to get longer than it is when there is no weight on it, for example when it is on your workbench, or on the bike when on the center stand. I had the same mistaken understanding, until i read up a lot about it. If you only had a spring on a bike, then when you hit a bump the bike would keep bouncing up and down as there is nothing to stop it. The damping is there to slow down the spring bouncing. The correct amount of damping is just enough to stop the spring bouncing too much, while not so much that the spring does not have enough time to bounce out again. This would lead to the spring compressing more and more after a bump. I hope this helps, and please let me know if I can explain it any better. Clockwise makes the damping stiffer and set the spring so that when the bike is loaded it sits 30mm lower than when no load. Is it necessary to add more clarification to the RickG, BobT, BAE, Dai and Corkboy contributions? No, but that won't stop me. Part of your assumption is incorrect. There is nothing you can do with this shock to raise the road clearance of the main stand. The shock was designed to lower the bike. It lowers the bike by being shorter than the stock height shock. Being shorter changes the angle of the swing arm relative to the road. Changing the angle of the swing arm brings parts of the main stand closer to the road. More weight on the bike brings those parts even closer to the road. It is up to you either to make modifications to the stand for safe clearance or avoid rough roads and lessen your lean into corners when necessary to avoid scraping the stand, losing control then possibly maiming or killing yourself and others in the process. If your strategy to avoid scraping the stand is to keep the shock from compressing, your ride will be so harsh you might eventually lose control of the bike anyway, leading to the maiming, killing and so forth. If "wobbling" means bouncing or wallowing, that probably can be lessened by rebound adjustment. pictures don't tell the full story unless there is some form of reference ...like a ruler ?!! While you'd get some minimal change in shock length (and hence more or less clearance and seat height), these adjustments are not designed for raising or lowering the bike. If, after adjusting sag and pre-load correctly, your stand is not clearing while cornering then you definitely need a longer shock. K1100 and K100 16V models use a 385mm shock. Another consideration is that by using a much shorter shock, you change the dynamics of the paralever which will possibly then be operating outside it design limits. Add a passenger, a good corner and some bumps or uneven road surface to compress the suspension even further making the shock shorter still, and you run the risk of stressing the CV joints. Another consideration is that by lowering the rear suspension you are changing the handling and steering characteristics of the bike. You need to lower the front as well. If you need any more find a lower seat or fit lower profile tyres. Some other options include elevator boots, or just get an extra cm added to your soles by your local shoe repairer. Thanks to all of you not lest corkboy. My mistake that I somehow thought that the design of the RAM would make it adjustable in length. Ok so it's just like any other suspension. It can be adjusted for the weight on the bike and the damp adjustment will reduce the bouncing. Now I might be a d... now but I still haven't got the answer regarding the big ring that either makes the spring short or long. You all know that the bike is too soft. It is set for practically no weight. So once more do I screw the ring up, putting pressure on the spring or do I screw it down releasing the pressure and making the spring longer. Probably me just not getting it, but I'm trying to make the question as simple as possible, hoping the answer will be equal simple since we all by now know that when it gets too techinal I just don't get it . I need help to know what does what. 1. I want to ride alone should the ring be adjusted up or down? 2. I want to ride with a passenger and all the bags and boxes I can possible put on the bike, with all the weight in I can. Should the ring be adjusted up or down? then I'll know where I'm add. Right now I have absolutely no idea if I can reduce the travel of the suspension by tightening the spring or by loosening it. So I'm SOL. As soon as someone can tell me the answer to question 1 I'll have the answer to question 2 automatically and I can go in my workshop and put pressure on the spring or reducing pressure and take a ride and see if the suspension gets harder (less "ware out"), which is the only thing I'm looking for after I finally got the fact that I need to turn the damp adjustment fully clockwise to reduce bouncing. I already have a extra central stand and if I ever get the RAM adjusted to my liking it will be reduced in size so it won't touch the ground in hard turns and I'll be able to use the stand with out putting a board under the back wheel. @BobT wrote: I am going to bed now, my head hurts. By winding it so that you are compressing the spring you will make the suspension harder. @Holister wrote: By winding it so that you are compressing the spring you will make the suspension harder. So putting pressure on the spring is what you do if you carry passenger and luggage right? Here is some additional information. I measured the seat height when loosening the pressure on the spring and when really tightening the spring. Second picture is tight spring (79 cm). Sit on the bike and support the weight by leaning against a wall. Ask a friend to confirm the attitude of the bike. Adjust the spring platform until you achieve the required position. So two million dollar question what "attitude"???? Any one can tell if first picture have a better attitude then the second. I have absolutely no idea what RAM is trying to advice. Secondarily what is the "required position"?? I have no way of knowing what I should look for. The reason your centre stand is scraping is because its not retracted back properly. It's hanging down. @Holister wrote: The reason your centre stand is scraping is because its not retracted back properly. It's hanging down. Yes on the picture it is, but it wasn't when riding yesterday (when ever I use it and go riding after I push it up). Even so, there's something amiss. You shouldn't have to push it back up. It could be loose and flopping down when you're cornering. 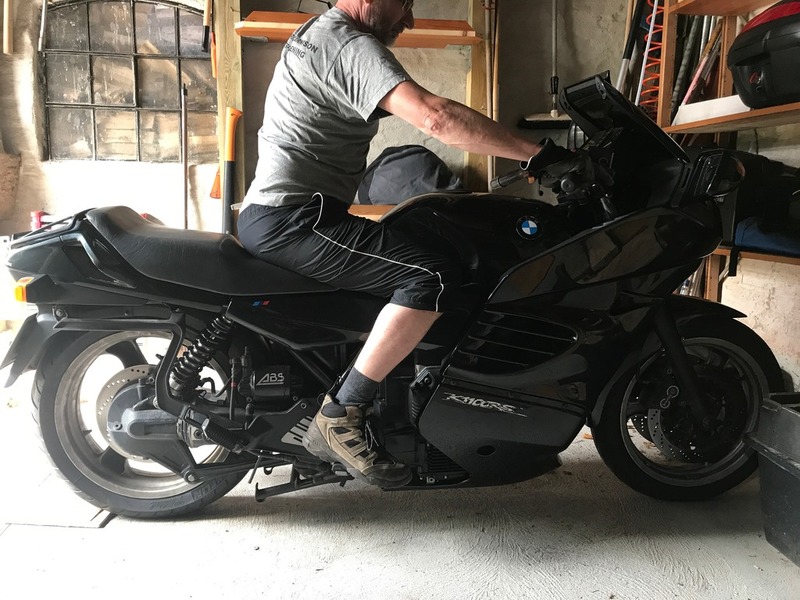 I get my K1100 over enough to give the pegs a good scrape and on occasions I've scraped the belly pan on a hard downhill corner under brakes while hitting a bumpy patch, but I've never scraped the centre stand. My shock is standard and set a little stiff. @Holister wrote: Even so, there's something amiss. You shouldn't have to push it back up. It could be loose and flopping down when you're cornering. Yes I need to give it som WD-40 and "work" it a little but if I leave the RAM on I'll reduce the extra stand in hight and that will solve the problem. 1. The bouncing (with understanding that turning the damp screw clockwise I'll reduce this, I'm sure I'll solve this problem. 2. Bike too soft (ware out). This might be covered by me turning the big ring up and putting more pressure on the spring. However I'm not sure I can turn it much more up, so what to do, when putting bags and passenger on the bike. Oh well right now I'm struggling to get a better soloride with the RAM. Danish bike wrote: So two million dollar question what "attitude"???? Any one can tell if first picture have a better attitude then the second. I have absolutely no idea what RAM is trying to advice. Attitude in this case is another word meaning tilt. Be sure the bike is not tilted left or right when adjusting the position of the spring you require. If the center stand is not greased well enough it can remain at the angle in the photo until it is kicked up or a jounce to the bike overcomes the friction created by grime that's inhibiting retraction. You keep asking the same questions but are ignoring the answer. Adjust the SAG as has been said. If you don't know what sag is the look at some youtube videos. The sag is adjusted using the spring compression ring. It will be very obvious which way to screw that ring when you adjust the sag. Adjust the sag for solo riding and do at again for 2 up riding then you will know that the spring compression ring is in the correct place for whatever load is on the bike. You will always have less lean angle (and this will scrape things) due to you buying a shorter than standard shock. Could you put that a bit differently, BobT? I'm starting to get confused. @BobT wrote: You keep asking the same questions but are ignoring the answer. Adjust the SAG as has been said. If you don't know what sag is the look at some youtube videos. The sag is adjusted using the spring compression ring. It will be very obvious which way to screw that ring when you adjust the sag. Pretty please with sucker on the top: Do I need to tighten the SAG for "2 up riding" or loosening it. Don't answer I finally figured that out my self just wondering why it is so hard to give a simple, straight up no BS answer. To me "adjusting the SAG" makes no meaning if you don't tell me to put force on the spring or loosen it for "1-up ride" contra "2-up" ride. Again don't answer I figured that part out. I was totally in the deep end so I could have been tightening and loosening the whole weekend, with solo rides and "2-up" rides. Sure eventually I would feel and find the difference. In stead I tried to use the forum. All I desperately have been trying to get an answer to, is which way for what. I know you are joking but YES which way for what (sorry I'm repeating myself but it's getting a little funny that it obiously is something that can't be answered). Before I started my post I 100 % knew it was a question of adjusting the sag. Just wanted a "heads up" on what did what. I finally got it. Thanks. My additional questions like the RAM instruction was simply to get more knowledge. I still don't know what the quote from the instruction was suppose to help me with, except hold the bike straight, if in fact that was it. I think what you might not realize, Danish Biker, is that calling somebody's sincere response to your question a "BS" answer can be interpreted as thoughtless and insulting by native English speakers—not that anybody here is likely to be that sensitive, but you never know. What you might ask instead is for a "less complicated answer". "BS" or "not straight up" is what your commander calls your answer when he asks you why you didn't follow direct orders. You are ofcourse 100% right but someone indicates that I just didn't want to get it so I kind of got a bit annoyed. But point taken. To clarify: To a none speaking English member a "no BS" answer is simply meaning a straight answer which in this case would be: "tighten the SAG for 2-up ride and loosen the SAG for solo ride" (or visa versa). I apreseated all the links, manuals and hints to go on YouTube but never really gave me the answer. @Danish biker wrote: The two million dollar question . . . I still don't know what the quote from the instruction was suppose to help me with, except hold the bike straight, if in fact that was it. That was it. I'll accept PayPal payment. @Laitch wrote: That was it. I'll accept PayPal payment. Still very puzzled to how else I could sit on my bike while a friend should watch? And what's with the required position? You've seen the pictures of me on the bike with the SAG fare down (first picture) and the SAG fare up (second picture). 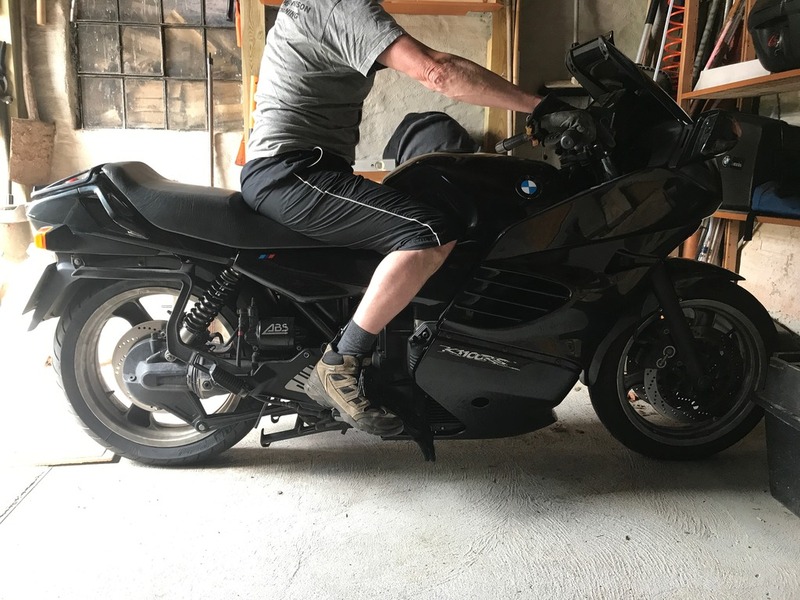 What's the difference besides the seat height (77 cm contra 79) what is my friend looking for (in this case all you forum readers. Some more friendly then others ). I'm off to the Ducati forum! Free Mikkeller , more than likely. He's also there so you can get an accurate measurement of the sag but it seems like you've done that already. That spring adjustment of sag is sort of your baseline. You adjust the rebound stiffness and bouncing from there. It takes experimentation to achieve and varies according to conditions—the main condition being the amount of weight on the bike but speed and terrain also figure into it, and also the center and side stands that apparently have been touching the road. Get out on the bike and work with it. OK, I love a challenge! Here is EXACTLY what i did when I got my new YSS shock for my LT.
2. With bike on center stand (no weight on shock) tie a piece of string around the inner damper rod of hte shock. a cable tie will also do. 3. Push the string up to the damper unit base. 4. Take bike off center stand gently, and gently sit on the bike. 5. Gently put bike on center stand. 6. Look at final position of string. It will show you how much the spring has compressed. 7. If the string is not at roughly 1/3 of the way from it's starting position, then adjust the collar. 7.b If the string has moved more than 1/3 then tighten the collar to compress the spring. 8. Repeat steps 3 to 7.b until the spring compresses by 1/3. 10. 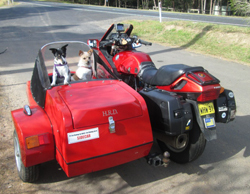 If you ride two-up, or with luggage, then repeat steps 4 to 7.b with you and your pillion of choice. (note, this will always be more compressed, as the weight is greater). 11 make a note of how many turns you had to turn the collar for the pillion, from point 9. This is the amount you will adjust the collar every time you carry a pillion. To be honest, I can't make it any clearer. The problem is that us folks on the forum are trying to explain it so that you will understand how it works, not just do it blindly. I cannot tell you to turn the collar one way or the other since I don't have a RAM shock and my YSS might be upside down in comparison to yours. 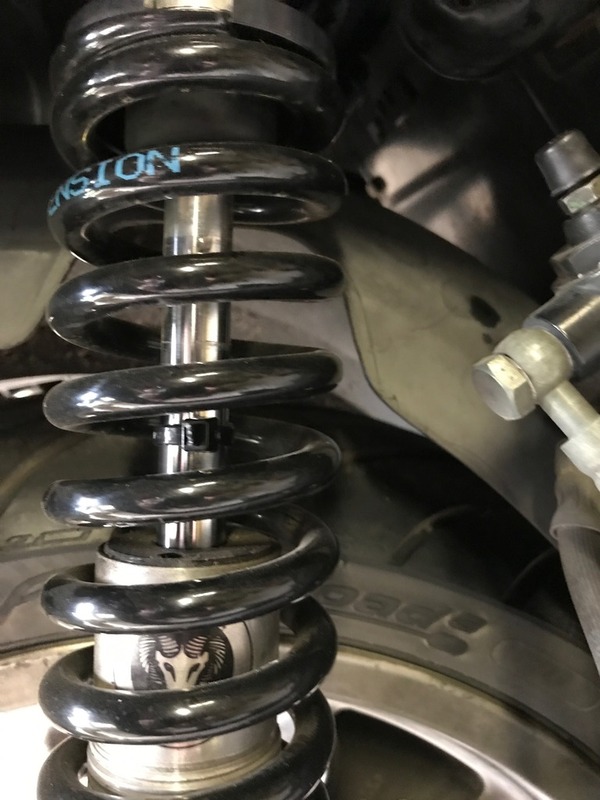 So I am trying to explain it so that you will understand the concept of how suspension works.Then you can apply this understanding to your shock. Please don't take this as insulting, we are trying to help,and I appreciate that English isn't your first language, which doesn't help with technical explanations. A lot of people have put a lot of thought into the explanations you have received. They are all correct. You must distill the understanding. I was going to add my spake but Corkboy has put it rather well. So, instead am off to listen to Mahler 8! @Corkboy wrote: OK, I love a challenge! Thanks so much for your effort. I've also recieved several privat messeages from friendly folks like you. It has helped a lot. I know I'm a bit SOL since i don't know expressions like "inner damper". Asuming it might be a part of the suspension (my guess the "shiny steel moving part"), but it could be something else on the bike. Sorry I'm not trying to be a jerk. Tomorrow I'll try to put your fine advice into actual action and see if I can manage to get a clear vision. Today I found out (solo ride) that the damp adjustment has to be almost fully clockwise before it was to my liking. I took a hard ride on a small bumpy country road with many turns. Kept adjusting and taking same tour again until I was satisfied. I know via this post I had hoped for a more direct solution. Any way 10 clicks out of the 13 clockwise. How ever with 2-up this damp adjustment might not work. I just have no idea. I'm not so worried about 2-up rides with bags and full weight. Won't be "racing" so I'm sure I can figure out how to turn (tighten) the SAG until the suspension doesn't wear out. A couple of guys have told me to adjust the height of the front fork. Just as much as I can before the forks actually reaches the steering bar. This because the bike now is actually lower in the rear. Any thoughts on this. Any way happy to say my solo ride today seemed pretty ok, even thought it was probably just dump shire luck. I had no idea what I was doing I just kept tightening the SAG until it was hard to turn the ring. PS RAM wrote me that I could get another top eye (the middle one) which would raise the suspension with 1,5-2 cm but then I would be back to egg and really need high heels. Danish lowering the bike creates problems with handling and getting it onto the stand. I'm 5'6" and can easily flatfoot my K75. I dropped the front forks through the triple trees 1/2" with no noticeable effect on the handling and I can still get it on the stand. The next thing I did was get some adjustable boot (shoe) lifts of Ebay. I then trawled all the local motor cycle shops for a pair of road boots with the thickest souls possible and tried the boot lifts to make sure they were reasonably comfortable with the lifts installed. Offroad adventure boots can be had with even thicker souls if you don't mind the style. If none of the previous bring you up to height get your seat reshaped and cut down. You can gain 2" plus with the boots and lifts 1" with the forks and 2" plus with the seat. that is a increase of 5" plus. When you are 2 up don't change the damping but put more tension on the spring to compensate for the extra weight, this is often all that is needed, and then adjust the damping if necessary. You have put a shorter shock absorber on to lower the seat height of the bike. This has lowered the whole bike making the stands hard to use. If you wind the big spring collar up(spring shorter/harder) it will lift the bike back up when you are seated on it but probably won't make any difference when you are not on the bike because it won't make the shock any longer or the bike any higher. The damping adjustment wont affect the height in any way. The problem you have is that if lift the bike by making the shock longer in any way to fix the stands, you get your high seat back. When you stand the bike up from being on the sidestand, with nobody sitting on it, does your shock absorber move at all? If it does sink with just the weight of the bike(SAG), adjusting the big collar up to push the spring will help you a little because you will make the shock longer and lift the bike a little. A better solution would be a standard length shock absorber and a low seat. On my RT with the 1100 paralever rear suspension fitted(effectively the same as yours, I'm using a standard length shock and a factory low seat conversion, this lets me get it low enough to flat foot on both sides (I personally don't think this is necessary so I've adjusted the rear height up a bit to make the steering a bit more responsive). A negative with the low seat is that the pillion space is more restricted, it's not important to me but might be to you. For reference I'm 5' 7" (170cm) with short legs. Here is a excample of how difficult it can be for none English speaking. A cable tie is what we call "an electrical stip" or simply a "strips". Any way after a good hunt in forest yesterday evening and a good nights sleep I sat down and read your post more then once and finally BINGO. PS for me a strip is something I use to "strip" people when in mission. You guys would of course say "tie". Potato potatoe - tomato tomatoe. To me it looks as if the "strip" moved 1/3 as you mentioned it should. Agree? If so my solo ride adjustment is spot on. Nearly, but not quite! When the bike is on the mainstand, measure the visible length of the inner damper rod. If you can see (e.g. 12cm) of the damper rod, then by 'one third of the way' Corkboy means that the 'stip' should have moved by 4cm. I very much appreciate the problem of 'English as a second language'. My job means that during any one day, more than half the people I talk to around the world have English as their second language. Sometimes it just means backing up slightly and finding a different way to say the same thing. @MartinW wrote: Danish lowering the bike creates problems with handling and getting it onto the stand. I'm 5'6" and can easily flatfoot my K75. I dropped the front forks through the triple trees 1/2" with no noticeable effect on the handling and I can still get it on the stand. The next thing I did was get some adjustable boot (shoe) lifts of Ebay. I then trawled all the local motor cycle shops for a pair of road boots with the thickest souls possible and tried the boot lifts to make sure they were reasonably comfortable with the lifts installed. Offroad adventure boots can be had with even thicker souls if you don't mind the style. If none of the previous bring you up to height get your seat reshaped and cut down. You can gain 2" plus with the boots and lifts 1" with the forks and 2" plus with the seat. that is a increase of 5" plus. Hi Martin I hear you regarding boots however VERY many of my rides are just 2 miles to town to pick up "what ever" so I most of the time don't "dress up" for rides. My idea (suggested by others) was lowering the front fork as much as possible only because the rear have been lowered. So I'm seeking ideas (knowledge) in this sense. My solo rides feel fine as for right now. No problems what so ever regarding I changed the angle of the bike. @Dai wrote: Nearly, but not quite! When the bike is on the mainstand, measure the visible length of the inner damper rod. If you can see (e.g. 12cm) of the damper rod, then by 'one third of the way' Corkboy means that the 'stip' should have moved by 4cm. Ok Dai I measured again. On stand the visible length is 9 cm. Bike easily down from stand. Me sitting on bike. Bike easily back on stand. The cable tie has moved 2,3-2,5 cm. So I'm asuming we agree I should screw down the SAG, thereby releasing pressure on the main spring until the travel of the cable tie is 3 cm. The SAG is 2.5 cm you cannot screw the SAG! You do not seem to have looked at anything on the web or you would know what SAG is! 2.5cm is fine for SAG so you do not need to screw the spring compression screw anywhere. Sag is an amount, a distance, not a device. Wouldn't it be great to explain the subject in a way, so that the recipient understands it, WITHOUT getting angry ?! Two people can look at that same picture, and they can have opposite views of what they're seeing. Keep this idea in mind when explaining a concept. Something that might be perfectly understandable to you might be incomprehensible to someone else. @BobT wrote: The SAG is 2.5 cm you cannot screw the SAG! You do not seem to have looked at anything on the web or you would know what SAG is! 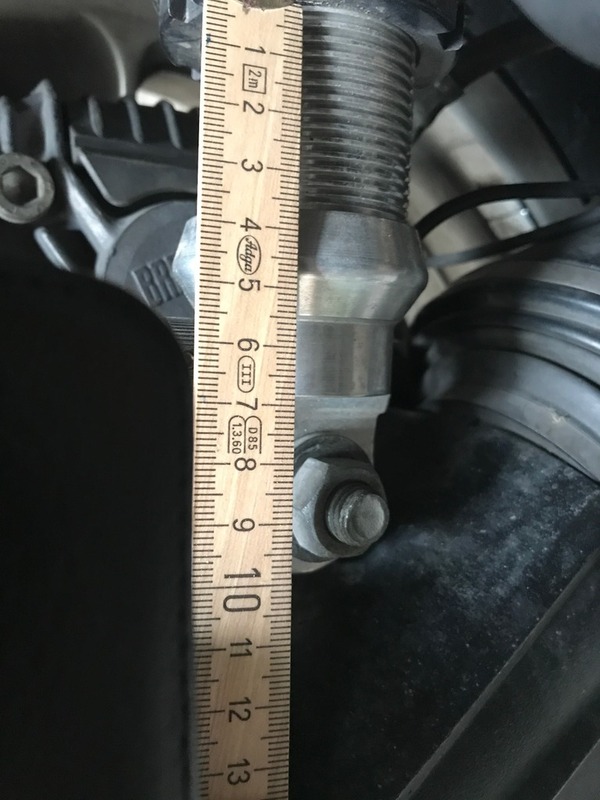 2.5cm is fine for SAG so you do not need to screw the spring compression screw anywhere.